There has been speculation for months that the giant bridal retailer was struggling financially and would declare insolvency. Now it’s confirmed. David’s Bridal says that they will file Chapter 11 business bankruptcy very soon. What does that mean for the wedding gown retailer and your Greensboro wedding in particular? The bridal retailer says it will use Chapter 11 to try and reorganize its debts and stay in business. They aim to reconfigure their liabilities without closing any stores or impacting operations. The company released a statement saying they’ve worked out terms on $400 million of debt owed to most of its creditors and think they have enough cash to press forward. David’s Bridal CEO Scott Key pledged that no bride would go without her wedding dress, so your Greensboro big day should be safe. In a statement, Key said, “We are and will continue to be open for business” and that means North Carolina brides-to-be can breathe a sigh of relief. This is the second bridal bankruptcy to crop up in recent months. In summer 2017, Alfred Angelo filed Chapter 7 liquidation bankruptcy and closed its doors for good. As a result, many brides were dress-less on their wedding day, even those who already paid upfront for their gowns. That’s not much of a happily ever after! 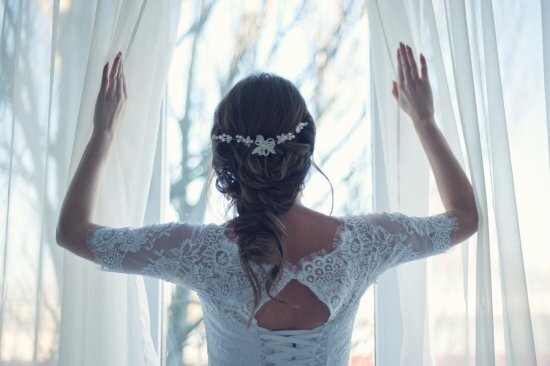 Some brides are panicking already and making plans to protect their money and wedding plans. Some brides are buying floor models or samples they can take with them. Others have yanked their dresses away from David’s Bridal rather than having the shop make the alterations – just in case they close their doors like Alfred Angelo. With wedding gowns averaging $1500-3200 but many costing $10k or more, it’s a big financial risk to take if your dress shop is in money trouble. You might think that if you’ve paid for your wedding dress, the shop must give it to you, even if they file bankruptcy. That’s not true. If the bridal company has your money and then files Chapter 11, you stand a much better chance of getting your gown. But with Chapter 7, since it intends to close down the business, you might be out of luck. After they file Chapter 7, everyone who paid but didn’t get their dress becomes a creditor who is part of the bankruptcy case. Unfortunately, you’d be way down at the bottom of the list below employees that are owed payroll, the IRS, and other priority creditors. It’s likely you’d never get a refund or your gown if your wedding shop files for Chapter 7 bankruptcy protection. So, what can you do? You’ll likely get a better deal and can protect yourself if you buy off-the-rack rather than ordering a dress. That way you can pay and walk out with your gown. Second, is to use an outside tailor to alter your dress. Wedding dresses are a specialty item so look for an independent tailor with experience with gowns and formal attire and be sure to check their reviews. Finally, if you’re already ordered from David’s Bridal, follow up with the company on your order, try to get it expedited and cancel the alterations (if practical) and have those done elsewhere. Since David’s has yet to file their bankruptcy case, there’s no assurance that it will be Chapter 11 reorganization rather than Chapter 7 liquidation, although all signs point to them trying to stay open for business. If you’re struggling with debt, Greensboro bankruptcy may be a solution to get you the peace of mind and fresh financial start you deserve. Read reviews from our clients, then call 1-888-234-4181 to discuss your money matters. Contact the Law Offices of John T. Orcutt today for a free Greensboro bankruptcy consultation at one of our locations in Raleigh, Durham, Fayetteville, Wilson, Greensboro, Garner or Wilmington.